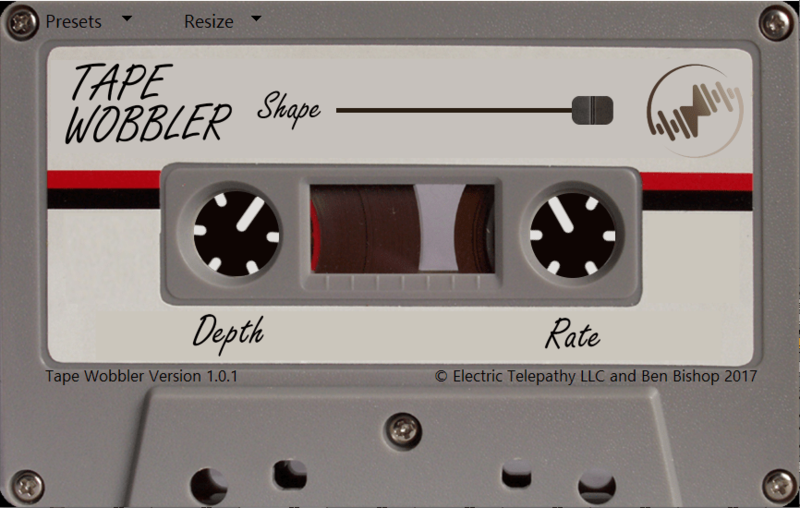 The Tape Wobbler is a modulation plugin designed to simulate the pitch distortions of aged audio tape. It focuses on a specific flavor of modulation in order to create authentic and musical pitch effects inspired by artists such as The 1975, Bon Iver and Helios. The controls of Tape Wobbler are simple. Rate and Depth control the frequency and amplitude of the pitch modulation. You will notice quickly that these are not similar to the Wow and Flutter effects of many other tape emulators. In order to prevent chaotic and unusable settings the depth and rate controls have been calibrated for musicality and precision (maximum depth is 15% of a half step and maximum rate is 7hZ). This allows you to focus in the exact type of pitch warping that is right for your audio. The Shape control is nuanced and totally unique to the Tape Wobbler. When set all the way to the right, the pitch modulation follows a consistent sine wave pattern acting essentially as a vibrato. When set all the way to the left, the effect is a short flutter to simulate a wrinkle in the tape. The most interesting applications of this plugin are in between these two extremes which create more intermittent effects. As the slider is moved from right to left the modulation event occurs less often. In other words, the rate and depth of the modulation remain constant but more audio is unaffected between the pitch wobble event. Try increasing the depth and/or rate control here so that the effect remains noticeable. When the plugin is inserted on a stereo track, the pitch effect is applied equally and symmetrically to both the left and right channels. However in some DAWs it can be opened as a dual-mono plugin so you can individually adjust the parameters on either side. If a lo-fi effect is desired, experiment with summing the output to mono to make the audio sound more degraded. Download the free trial to make sure Tape Wobbler works on your system. Start making music with Tape Wobbler today!